This bulletin covers the following Champion Power Equipment models: Generator models 41332 and 41532. Please read the instructions completely and carefully before performing the service. Fuel and fuel vapors are highly flammable and extremely explosive. Fire or explosion can cause severe burns or death. Unintentional start-up can results in entanglement, traumatic amputation, or laceration. When servicing: Loosen the cap slowly to relieve pressure in the tank. Always keep fuel away from sparks, open flames, pilot lights, heat, and other sources of ignition. DO NOT light or smoke cigarettes. Wipe up any spilled fuel immediately. Allow fuel residue to evaporate fully before attempting to service or start the engine. Make certain that the product is resting firmly on a leveled ground. DO NOT tip the product or allow fuel or oil to spill. Make certain that the fuel shut-off valve is in the "OFF" position. Sparks can result in fire or electrical shock. 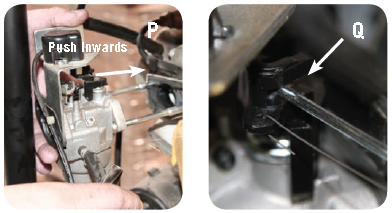 When servicing: Disconnect the spark plug wire and place it where it cannot contact the spark plug. DO NOT check for spark with the plug removed. Use only approved spark plug testers. Part Locations: 1. Carburetor, 2. 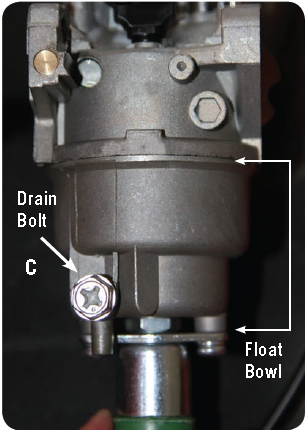 Fuel Valve, 3. Air Filter Cover Assembly, 4. Governor Rod. 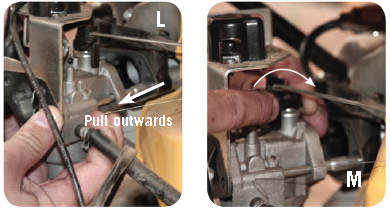 Turn the fuel valve to the "OFF" (horizontal) position. (A) Make sure the fuel supply is off before performing any maintenance. Disconnect the negative (-)(black) cable from the battery. Even with the fuel valve in the "OFF" position, some fuel may still spill out. Make sure to wipe up any spilled fuel. 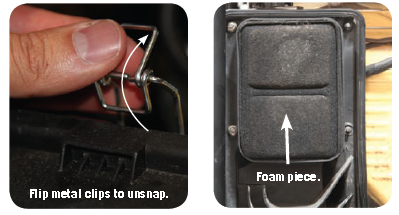 Unsnap the metal clips (top and bottom of the air filter cover), and remove the cover from the air filter housing. Remove the foam air filter from within the air filter housing. 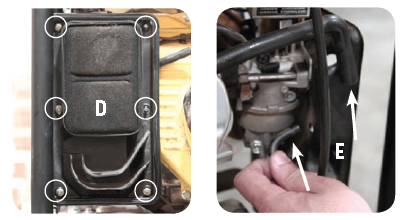 Oil, liquid, and other debris may become dislodged and spill out when removing the foam piece and disconnecting the air filter housing from the generator. Disconnect both the fuel cut solenoid wires (green) and the choke actuator wire connector (white). 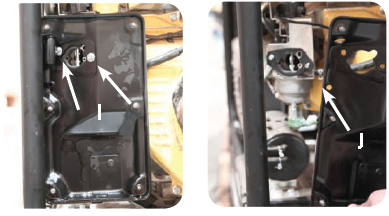 (G) The wires are located on the yellow engine shroud, with the connection points just behind the electric panel. The wire clips will "pop" out, using minimal force. Take the complete air filter housing off of the generator. If the insulator gasket comes off, we have included an extra one if needed. 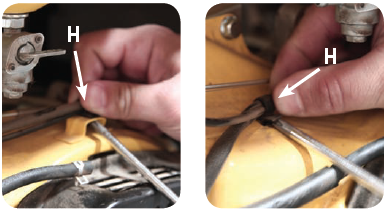 While holding the replacement carburetor assembly together, cut the zip ties, making sure nothing comes loose or apart from the assembly. 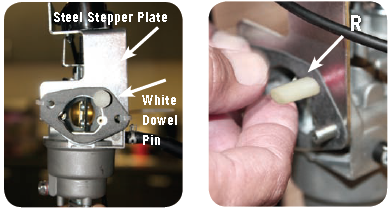 Once the white dowel pin has been removed, the steel stepper plate may move, causing the choke dampener spring to become loose and fall out. 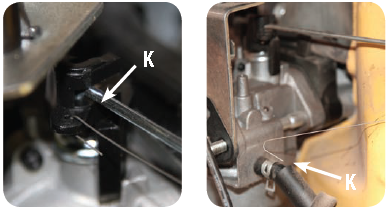 If this occurs, see additional steps at the end of this bulletin to reconnect the spring with the assembly. Reverse steps 1-11, reconnecting and reattaching the air filter housing, wires, fuel valve hose, and negative battery lead. Once all the parts have been reconnected, check all parts and connections for leaks. 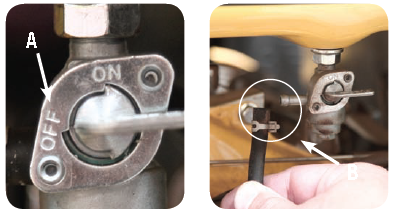 Turn the fuel valve to the "ON" position. Start the engine. Make certain that the gas cap, air filter, spark plug, fuel lines, and exhaust system are properly in place before starting the generator. Run the generator for a few minutes (with no loads attached), to verify a stable running condition. Use your generator's Intelligauge™ or Voltmeter to read the output of volts produced. The range of volts should be between 245 and 255, for a stable running condition. Once a stable condition has been verified, shut off the fuel valve and run the engine until fuel starvation has shut it off. Once this has happened, turn the engine and battery switch to the off position. It is always advisable to the shut off the fuel valve and run until fuel starvation has shut off the engine. Leaving the fuel line and the carburetor free of fuel is recommended. View and download the PDF version here.